What are the PWM pins on this board? Pins 5, 6, 9, 10, & 11 are all PWM pins. I'm super new to these stuffs and I've been wondering...do you need a battery for this? Or will it actually charge(and would last) after being connected to a computer? Or does it actually even need a battery to be operable even if connected to a PC? It looks like in the board layout and the schematic that the application circuit for the charger IC does not power the bluetooth through the FTDI header pins. To get the bluetooth mate working with the LilyPad Simple board, you would need to reroute the pins so that you can provide power to the bluetooth mates https://www.sparkfun.com/search/results?term=bluetooth+mate . Assuming that you are soldering a 6 pin female right angle https://www.sparkfun.com/products/9429 to the bluetooth plated through holes, you would need to connect the m/f jumper wires https://www.sparkfun.com/products/9140 between the two boards (Tx, Rx, and GND). For the Vcc pin of the bluetooth mate, you would need to connect it to a power source. Assuming you are using a nominal 3.7V LiPo battery (like the batteries with the silver and yellow packaging - https://www.sparkfun.com/products/339 ), you would just need to connect the Vcc pin to the + pin of the LilyPad Simple. There are a few methods to do this. 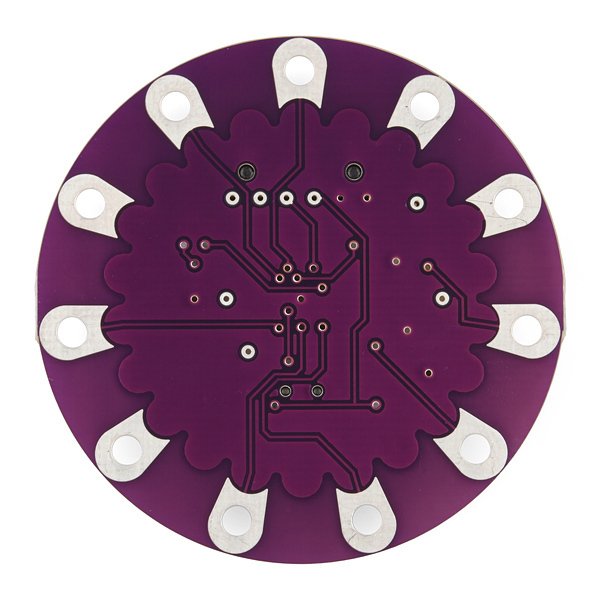 You could us a m/m jumper wire https://www.sparkfun.com/products/8431 , bend one end to make a sequin, and sew the terminal end to the + pin of the LilyPad . Here is one example of making a sequin using non-standard LilyPad components https://www.sparkfun.com/tutorials/281 . You can also cut the m/f jumper wire in half, use wire strippers to remove the insulation, and then make an additional sequin out of the wire with the male terminal. It would have been helpful if there was a link or even a note that a device like the FTDI Basic Breakout would be needed to communicate with this board. It's a major disappointment when I'm trying to learn all this stuff and now have to wait for another part to arrive before I can assemble my project. Help streamline this stuff for us by adding the link in the description. I was checking the schematic and noticed that the R_prog resistor is set to 1K ohm. Is this correct? According to the MCP73831 datasheet, 1K R_prog corresponds to a charging current of 1 amp. This sounds quite a lot and will probably charge the battery too fast. Any idea? "The charging circuit means the LilyPad Simple will charge the included LiPo battery when plugged into a powered USB port." I am a beginner, and ordered a separate LiPo charger, thinking it was missing from the beginner's kit, even after carefully reading this description when researching the kit. You won't need a separate charger. Just connect the lipo battery to the Lilypad Simple. The Lilypad Simple will charge the lipo battery when powered by the FTDI basic through your USB Port. Will this host an XBee board? If the device is connected to a lipo battery, how much power (ma) can be output on the "+" pad? Is it directly connected to the battery, or is it like the regular Arduino +3.3 pin that would have a significant limit on the power it can provide? Hi everyone, I was wondering if this product will charge the Polymer Lithium Ion Battery - 2000mAh? Also if I'm looking into more power, will it be able to power the Polymer Lithium Ion Battery - 6Ah? 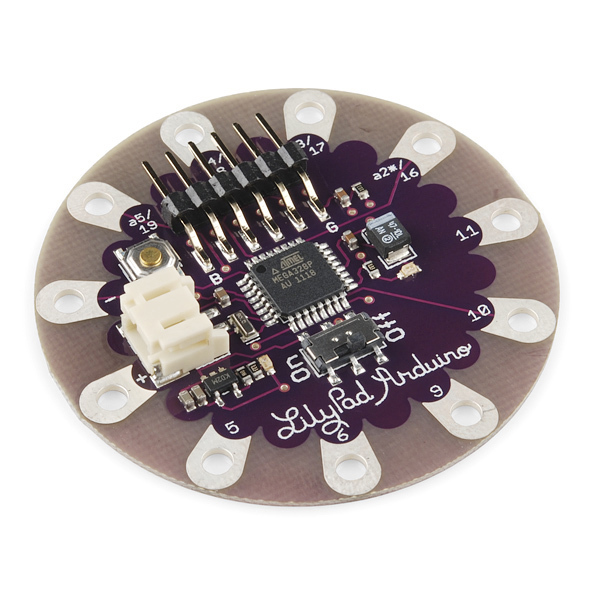 The data sheet doesn't specify I2C pins, like the Lilypad USB, are they still built in? I am trying to build a simple LED blinking project and it will have to solely operate on the batteries for several hours. I am trying to figure out how long can I keep the project going on the battery. Any idea how much current the board alone consumes? it really depends on what you're doing. it's going to be pretty minimal though. your best best would be to hook it all up, and then just test how much the current draw is. from there, you can calculate how much battery capacity you need for the desired number of hours. The addition of the charging circuit is super handy. However, since it's been added it seems that the Bluetooth Mate isn't able to get enough voltage when connected via the FTDI headers. Is anyone else having this problem? You're right- it won't. The Arduino LilyPad mainboard will work still, so if you need Bluetooth connectivity, you'll have to use that board. We'll try and fix it in a later rev. via AnalogReference(INTERNAL) command, which i expected to be 1.1v reference, it doesnt seem to be. It still seems to be using supply voltage (which is a pain since I am trying to measure the supply voltage). Does anyone know whats going on here? Or what the internal voltage ref actually is? You'll need to lift pin 20 (ARef) - it's tied to Vcc on the board. See figure 23-1 and section 23.5.2 in the datasheet (http://www.atmel.com/Images/doc8161.pdf). What is the orange LED next to the on switch? I don't see it in the schematics, but I'm new at this so may be missing it. I'm assuming it has to do with whether the board is running from USB power or battery power? Or whether the USB is currently charging the LiPo battery? It seems to sporadically come on, whereas the green LED on pin 13 is blinking every second as per the basic sketch. It's just the basic 'power' LED. Check top right on schematic, it's on the voltage regulator. I just answered a question about the LiPo charging circuit in another product, and your comment made me wonder; You say that the LED (D4) is on the voltage regulator - but it's actually on the mcp73831 Li-Po charge management controller. Specifically, it's on the STATUS pin, which should mean that it does actually indicate charging status? oh, you're correct, it indicates charging, not power. Hey, I'm thinking of using a LilyPad Simple board to drive some of the digital LED strips using LadyAda's PWM library. That library uses the ATmega's hardware SPI pins which, on a normal Arduino, are broken out on arduino pins 11, 12 and 13. From the schematic it appears that the appropriate pin does something on the LilyPad simple but is not available for general use? Is it at all reasonable to pull that out somehow? The SPI pins are always broken out somewhere, it might be a test pad but they are always broken out. The chips come in and are always soldered to the board unprogrammed, so we always need access to the SPI pins to get the bootloader on the board. Check the schematic and Eagle files, I think there are test pins on the board which you can solder to if needed. 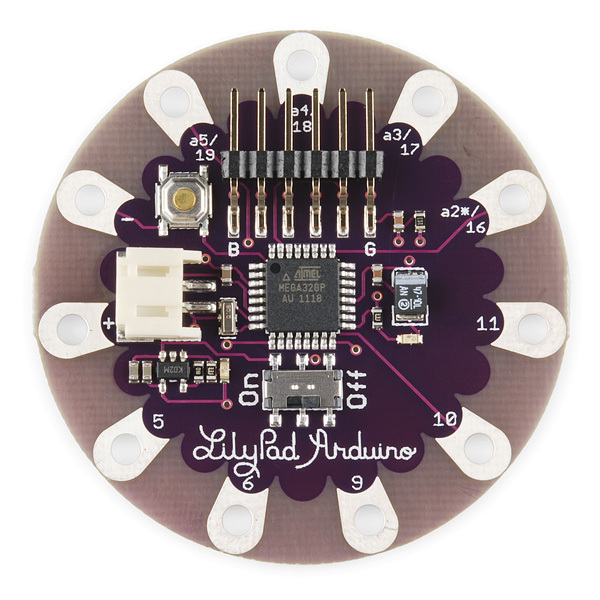 URGH - I double checked the LilyPad simple schematic. You are correct in that the SPI SCK is not pinned out. You will be fine with the non-PWM libraries which can use any pins. Otherwise you will have to "skywire" a connection to ATMEGA side of R1. My kids are using the regular LillyPad so they are all set. It's no problem. Those pins are dual use for GP I/O and an SPI interface. They are available for any use that you have. They are connected to the unpopulated ISP headder in case someone wanted to reflash the default boot code, which you don't want to do. There is no difference between the LilyPad and the standard Arduino in this respect. 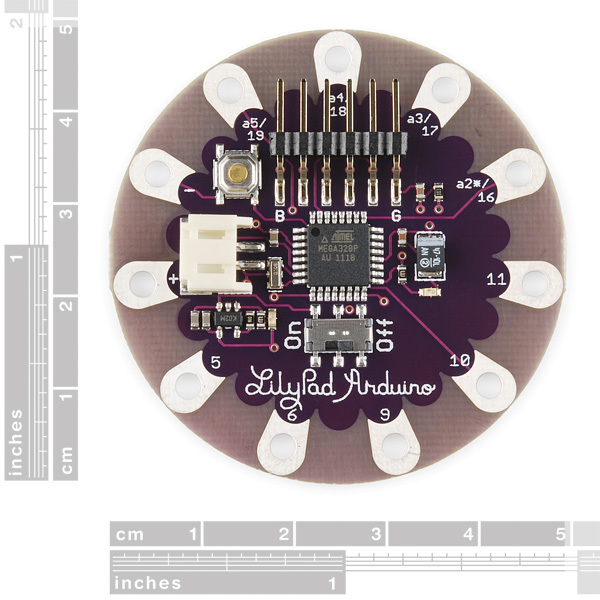 The LilyPad schematic just has them labeled for both uses. In fact the PWM ADAfruit library uses them as SPI pins so you are all set! LilyPad Simple does not have pin 12(MISO) but this is not used in the library so it's no problem. BTW - it looks like the non-PWM example can use any pins. I got the same ADAfruit RGB strips and will be trying to get this to work this weekend with my kids. They want to wear flashy T-shits at the European Lego Robotics Championship in two weeks (representing the US) so I hope it works! Good Luck. Whoa, it's in stock and from the April 1st New Product Post. Is it real? Bill, the parts which are in stock are real. It's not hard to figure out. I noticed that, just looking for confirmation in case someone ordered one and didn't get their money back 5 minutes later. Hey Robert, the schematic & eagle files don't match the new board. Indeed they are not. Could someone at Sparfun fix this? I believe the discrepancy has been rectified. Yeah, that was my first thought as well. I think the idea is that the board is mounted "upside down", that is, with the component side facing the fabric. The back of the board is completely flat.